Casio Classpad fx-cp400 (aka Classpad II) announced in late November is the latest addition to the Classpad line of calculators, after the introduction of the refreshed Classpad 330 Plus in 2012. Featuring a high resolution 4.8 inch large touch-panel LCD, the fx-CP400 provides clearer images of mathematical data for students, as well as a better way to comprehend the relationships between their equations and graphs since the calculator can display both at the same time. Also, with the touch of a button, the fx-CP400 can switch from a vertical view to a horizontal view (Landscape mode), which is convenient for displaying long mathematical formulas/expressions on a single line. Definitely the new LCD is the strong point of the calculator. Image 1 - Classpad fx-cp400 (left) and classpad 330 (right) together. Image 2 - Classpad fx-CP400 Landscape mode. When compared to previous Classpad models the first point that strikes one is the new LCD. There is also a new physical button, SHIFT. It can be configured in the settings to do small tasks faster (like copy, paste, cut, undo). The novelty is in the existence of the physical SHIFT button, because in older CP 300/330 (Plus) was possible to have a "shift" button also configurable but using the (-) key instead. Although fx-CP400 has almost all the functions of its predecessor there is still no 3d graphics. 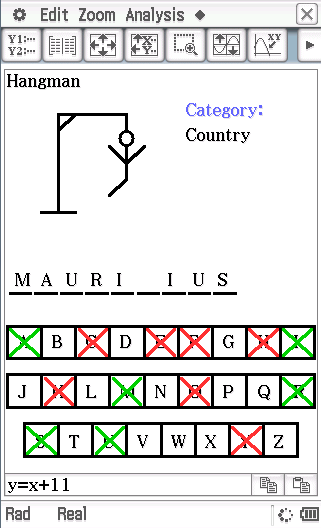 Another difference that I noticed during my tests was the absence of portuguese language and the addition of a new language, "suomi". 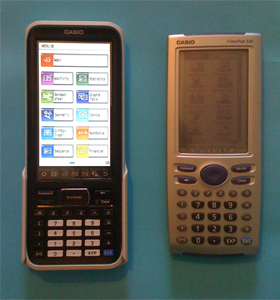 The Casio classpad currently is banned from tests like SAT, ACT, and the AP Calculus test in USA. For this reason, the calculator is more popular in Europe, Australia, Latin America and middle east than USA. As a CAS calculator, it comes with advanced calculus capabilities like Ti Nspire CX Cas, Ti-89 or hp 50g and future hp Prime. It can work with variables, solve limits or even systems of equations, derive, calculate vectors/complex/matrices... 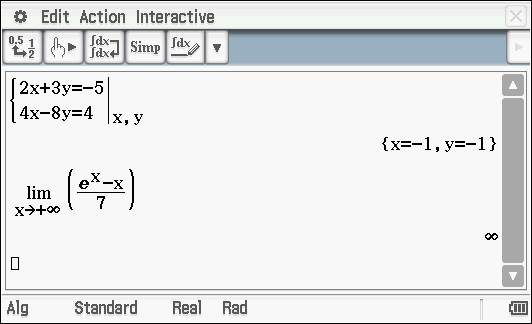 There is also built in options for calculate Laplace-Transformation and Fourier-Transformation. Taking advantage of the larger touch panel, is possible drag and drop equations directly to graph it or use the calculator in landscape mode to input/display larger mathematical formulas/expressions (images 2 and 3). Image 3 - Using the fx-CP400 in landscape mode. In Graph&Table is possible use real images as graphics background. These images use a proprietary format (*.c2p) and still there is no software to convert. Contrary to Casio Prizm, there is no "Picture-Plot" function. 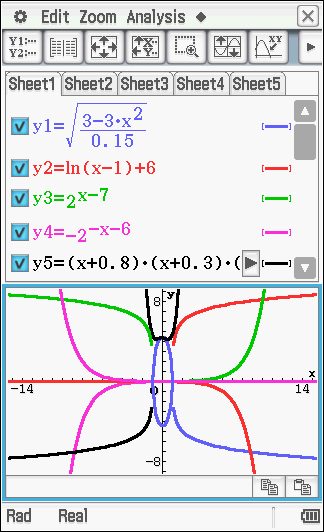 Image 4 - "Butterfly" drawn just with equations in Graph&Table menu. There are also other functions like Spreedsheet, Statistics, Diff-Eq Graph, Num-Solver, Conics, Geometry and Financial making the fx-CP400 not only a calculator indicated to algebra learners but also for financial students or to help learn geometry, statistics... In mathematics, everything is connected . 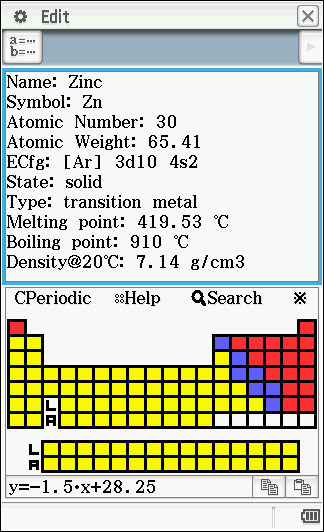 eActivities that appeared original in Classpad 300 and after arrived in fx9860g/prizm are also present. They allow teachers create documents for students learn in a more dynamic way, with exemples, notes and links to other classpad functions/menus previously mentioned. The calculator comes with a built in easy to learn basic language, similar to the Classpad 300/330 (Plus). Were added a few new commands mainly related with color and obviously the max coordinates of the screen are now different. Although it is not very fast, it is possible to create games and programs with it. I myself have created some basic programs and games, available for download in fx-cp400 downloads section. Free feel to upload also your future cp400 projects in our downloads section and share it with us in released projects sub-forum. Definitely the fx-CP400 is a great educational tool. Although I have only begun to test the calculator recently, my feedback is very positive. The high resolution 4.8 inch large touch-panel LCD is the hallmark of the calculator. For those who are accustomed to using touch screens without stylus in smartphones/tablets (like me), will find that the stylus is even more practical and elegant way to use the calculator combined with her keyboard. Stylus allows writing faster formulas/equations. Another good aspect is that the calculator works as usb storage device when connected with the computer. Is possible connect the calculator to pc anywhere (home, school, library...) without any extra software in all systems (Windows, Linux, Mac...). Comparing this calculator with other market alternatives, the strong competitor is still the Nspire CX Cas. 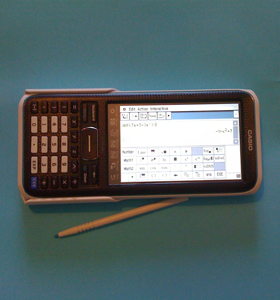 But HP is not out of the race, and the proof is the newly announced HP Prime, a multitouch graphing calculator with CAS. Could you translate this new for PC ? I'm not good with French language to translate it. Administrator of the French website Planète-Casio.